1980 Sky Kneeboard, Designed by George Greenough, 5 ft 8 1/2"
Foam blank, 1/8" redwood stringer, post production wrist rope plug - r/h front. 1. GEORGE GREENOUGH DESIGN and Plane graphic. Blue, on nose. 2. Shaped by Chris Brock in box. Black at pod. 1. SKY Red and black on the nose. 2. 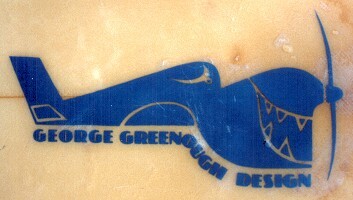 GEORGE GREENOUGH DESIGN and Plane graphic - blue, forward of fin. George Greenough design/principles shaped by his good friend, Chris Brock. Deep 'foam' spoon, double Hull bottom, all clear with repaired dings in water tight condition. A very important board for collectors and riders. 7/10. Very rare!! Originally based on a spooned deck balsa wood kneeboard, the Greenough Flex Spoon (Velo 1) was molded off the bottom and then had foam block rails added. This construction method was not followed by other manufacturers - a full blank was shaped with a thin foam base that was removed after laminating the bottom. First used in Australia in 1965, George Greenough's performance had a huge impact on many Australian designers. The design was given exposure in the surf media as was George Greenough's surfing and surf photography. Many manufacturers made copies of the design and the intensive glassing requirements required a premium price. The most recognised models were produced by at Hayden Surfboards Caloundra Queensland, featuring Greenough's dramatic Fighter Plane decal, see below. The design peaked in popularity around 1970 with the release of George Greenough's The Innermost Limits of Pure Fun - featuring some his surfing on Spoon and inflatable mat (see #66) but most famously included on-board footage of radical performance surfing and serious tube rides. Because the high performance capabilities of the design were only achievable in quality waves and the low floatation meant that only the most fit riders were able to catch waves, by 1973 the design was largely supplanted by Peter Crawford's Slab design, circa 1969, see # 83. Initially Peter Crawford simply filled in the spooned deck to greatly increase floatation and expand the wave range, but over a long life the Slab was apadpted with a range of rail shapes and fin configerations, see # 58. In the USA the Fish was a notable alternative in kneeboard design. Greenough's extreme design was attempted to be recreated in stand up boards, most infamously by Nat Young at Gordon Woods Surfboards in 1965, see The Nautilas. 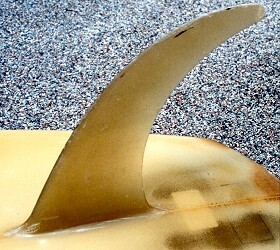 Although this board was a failure, George Greenough's fin design was to have a huge impact on Australian surfboards and by 1968 almost every fin bore some relationship to Greenough's high apsect template. In 1967 Midget Farrelly, Bob McTavish and other shapers in Sydney developed a short deep vee bottomed board that had strong elements of George Greenough's influence, see # 26.
the wave of the future"
George Greenough/North coast freefall, circa 1965. Jackson, Greenough Spoon 5 ft 10"
Backyard, Spoon deck Kneeboard 5ft 6"
See Paipo Catalogue for other Kneeboards. August 1969 pages 92 to 95.